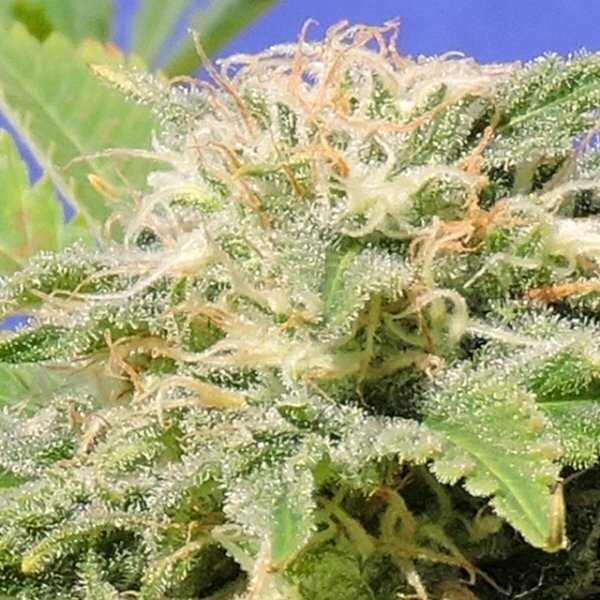 Kali AK is a Sativa dominant cannabis hybrid with well-known and award-winning parents: AK-47 and Kalimist. The plants exhibit a vigorous growth, have a good resistance to mold and pests, a short flowering time of only 55-60 days and produce buds with a tasty flavor and aroma and lots of THC, namely 20%. Long-lasting, mainly cerebral high. One look at her ripe buds and you know you are in for some serious business in regards to potency. And your eyes didn't play a prank on you, for her parents are the well-known AK-47 and Kalimist and both are no duds, but award-winning high fliers. Kali AK is anything but lame - this Sativa dominant cannabis hybrid boasts about a vigorous growth, a good resistance to mold and pests, a short flowering time and a highly potent end product with a dainty flavor and aroma. Due to the Sativa dominance Kali AK tends to grow pretty tall, so switch her to flowering early - outdoors you should opt for an undisclosed spot, for a blind man could not overlook this plant. Despite aforesaid dominance the plant fills up its flower clusters rather quickly, reaching full maturity after 55-60 days of flowering - or in late September/early October when reared outdoors. Kali AK develops large compact buds, totally covered in resin and full of intoxicating constituents. In a grow-room you can expect an average yield of 400-550g/m² - outdoors, where she prefers a warm and dry climate, it is possible to reap 600-800 grams per plant. And she surely isn't miserly in respect to cannabinoid production; 20% of the properly dried and cured buds are THC. In respect of flavor and aroma expect notes of citrus fruit, sandalwood, incense and spices. The long-lasting high is mainly cerebral, pretty much the perfect weed for a funny time with your friends.